Configurable all-of ACL. Each ACL line is a conjuction of ACLs. Uses AndNode and OrNode to handle squid.conf configuration where multiple acl all-of lines are always ORed together. Definition at line 20 of file AllOf.h. Definition at line 35 of file InnerNode.cc. References aclRegister(), assert, Acl::InnerNode::nodes, and NULL. 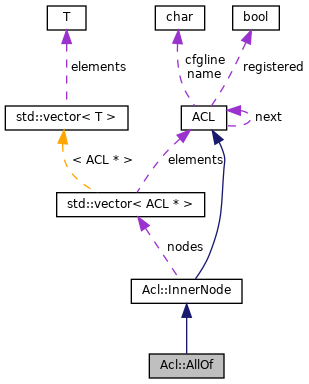 Referenced by Acl::Tree::add(), Acl::InnerNode::childrenCount(), Acl::InnerNode::lineParse(), Acl::NotNode::NotNode(), parse(), and ParseAclWithAction(). Definition at line 30 of file InnerNode.h. References Acl::InnerNode::add(), Acl::InnerNode::doMatch(), Acl::InnerNode::dump(), Acl::InnerNode::empty(), Acl::InnerNode::lineParse(), Acl::InnerNode::match(), Acl::InnerNode::nodes, and Acl::InnerNode::prepareForUse(). Definition at line 23 of file AllOf.cc. Referenced by aclParseAccessLine(), aclParseAclList(), parse(), ACL::ParseAclLine(), and ParseAclWithAction(). Definition at line 35 of file AllOf.cc. References assert, Acl::InnerNode::empty(), ACLChecklist::keepMatching(), ACLChecklist::matchChild(), and Acl::InnerNode::nodes. Definition at line 29 of file AllOf.cc. Definition at line 29 of file InnerNode.cc. Referenced by aclParseAccessLine(), Acl::InnerNode::childrenCount(), doMatch(), dump(), and parse(). Definition at line 45 of file InnerNode.cc. References a, Acl::InnerNode::add(), ACL::cfgline, config_input_line, DBG_CRITICAL, debugs, ACL::FindByName(), NULL, self_destruct(), ConfigParser::strtokFile(), and xstrdup. Referenced by aclParseAccessLine(), aclParseAclList(), Acl::InnerNode::childrenCount(), Acl::AnyOf::parse(), parse(), and ParseAclWithAction(). Definition at line 87 of file InnerNode.cc. Definition at line 51 of file AllOf.cc. References Acl::InnerNode::add(), Packable::appendf(), assert, ACL::cfgline, Acl::InnerNode::childrenCount(), config_input_line, MemBuf::content(), ACL::context(), Acl::InnerNode::empty(), MemBuf::init(), Acl::InnerNode::lineParse(), ACL::name, Acl::InnerNode::nodes, NULL, and MemBuf::terminate(). Definition at line 22 of file InnerNode.cc. Definition at line 93 of file InnerNode.cc. References ACLChecklist::asyncInProgress(), debugs, Acl::InnerNode::doMatch(), ACL::name, and Acl::InnerNode::nodes. Definition at line 17 of file AllOf.cc. Referenced by ACL::context(), Acl::InnerNode::lineParse(), parse(), ACL::ParseAclLine(), and ACL::~ACL(). Referenced by ACL::ACL(), ACL::cacheMatchAcl(), ACL::context(), Acl::NotNode::dump(), dump_acl(), ACL::FindByName(), ACLRandom::match(), Acl::ConnectionsEncrypted::match(), ACLDestinationIP::match(), ACL::matches(), Acl::NotNode::NotNode(), parse(), ACL::ParseAclLine(), ACLMaxConnection::prepareForUse(), Acl::InnerNode::resumeMatchingAt(), and ACL::~ACL(). Definition at line 52 of file InnerNode.h. Referenced by Acl::Tree::actionAt(), Acl::Tree::add(), Acl::InnerNode::add(), Acl::Tree::bannedAction(), Acl::InnerNode::childrenCount(), doMatch(), Acl::NotNode::doMatch(), Acl::AndNode::doMatch(), Acl::OrNode::doMatch(), dump(), Acl::InnerNode::dump(), Acl::InnerNode::empty(), Acl::InnerNode::match(), parse(), Acl::InnerNode::prepareForUse(), Acl::InnerNode::resumeMatchingAt(), Acl::Tree::treeDump(), and Acl::Tree::winningAction().